Dozens Killed as Syrian Airstrikes Pummel Rebel Areas. 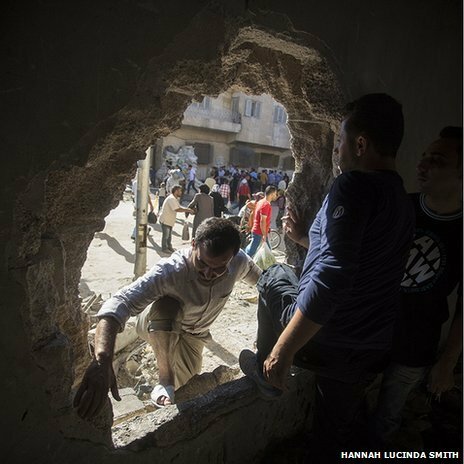 Syrians look at the aftermath of an airstrike on a rebel area of the northern city of Aleppo on Dec. 15. Syrian government aircraft pounded opposition areas in the northern city of Aleppo and near the southern border with Jordan on Monday, a day after airstrikes killed at least 76 people, while the United Nations issued a record appeal for $6.5 billion to help the millions of Syrians uprooted by their homeland’s civil war. President Bashar Assad‘s air force is his greatest advantage in the country’s civil war, and he has successfully exploited it to stem and even roll back rebel advances across the country. Human rights groups say Syrian military aircraft have carried out indiscriminate air raids that frequently hit civilian targets, such as hospitals, bakeries and residential areas. The government has relied on its air power in particular in northern Syria, much of which fell to opposition fighters over the course of the past year. One of the major battlegrounds on that front is Aleppo, where Assad’s forces and rebels have been bogged down in a bloody fight since rebels launched an assault on the city in mid-2012. With no end in sight to the fighting, the humanitarian situation is worsening among 8.8 Syrians who have been uprooted from their homes. Of those, 6.5 million are internally displaced and the other 2.3 million have sought refuge abroad. In Geneva, the U.N. appealed to donors Monday for $6.5 billion in funds to help support the nearly 9 million Syrians uprooted by the conflict, the largest ever appeal for a single crisis. The appeal is based on projections of continuing humanitarian needs because of the massive displacement of Syrians both inside and outside the country into 2014. Some $2.3 billion will assist people inside Syria and the remaining $4.2 billion is expected to help refugees and host communities in countries like Lebanon, Jordan, Turkey and Iraq, the U.N. said. “We’re facing a terrifying situation here where, by the end of 2014, substantially more of the population of Syria could be displaced or in need of humanitarian help than not,” said High Commissioner for Refugees Antonio Guterres. The situation in Syria has “deteriorated beyond all imagination,” and the country can’t afford another year of it, U.N. chief Ban Ki-moon told reporters in New York in his end-of-year press briefing. The U.N. food agency, meanwhile, said it is expanding its emergency operation to provide food to more than 7 million Syrians driven from their homes by the violence. Recent assessments by the World Food Program show that almost half the population inside Syria is experiencing food shortages and more than 6 million people urgently need food to survive. In 2014, the WFP plans to feed 4.25 million internally displaced Syrians and nearly 3 million Syrian refugees in neighboring countries, the agency said in a statement Monday. The food agency also plans to increase the size of its food basket to provide more calories per person per day as other sources of food are increasingly scarce for the most vulnerable. On Monday, a day after government helicopters dropped barrels packed with explosives on several Aleppo neighborhoods, the Britain-based Syrian observatory for Human Rights on Monday said the death toll from those strikes had risen to at least 76, including 28 children. The government frequently uses barrel bombs, which contain hundreds of kilograms (pounds) of explosives and cause massive damage on impact. Amateur videos posted online showed the aftermath of Sunday’s airstrikes: buildings leveled by the explosions, rubble-strewn streets and smoldering wreckage of vehicles. Another activist group, the Local Coordination Committees, said at least 12 neighborhoods were hit and put the death toll at 83. It said that number is likely to rise because of the large number of wounded and the lack of sufficient medical supplies. In a statement, the Coalition also said it has documented the names of 103 people who were killed and more than 350 who were wounded in Aleppo, in addition to 21 who died in the town of Dumeir in Damascus suburbs in air raids. “The Assad regime continues to kill civilians across Syria, blocking aid convoys from reaching stricken areas, and refuses to release prisoners — practically consecrating through all of that, its rejection of a political solution,” it said. The Syrian government and its opponents are scheduled to meet in Switzerland on Jan. 22 to hold their first face-to-face peace negotiations. Expectations for a breakthrough are low at the U.N.-brokered talks, which aim to find a political resolution to the conflict that has killed more than 120,000 people since it began in March 2011. UN Probes 7 Syrian Chemical Cases, Some After Aug 21 Attack. Chemical weapons experts in UN vehicles leave a hotel in Damascus on Sept. 26. U.N. chemical weapons inspectors in Syria are investigating seven cases of alleged chemical or biological weapons use, including three incidents around Damascus after the Aug. 21 attack which almost triggered U.S. air strikes.The inspectors expect to finalize their work in Syria on Monday and issue a report by late October that will give more details of the Aug. 21 incident which they have already said involved the use of sarin gas, a statement from the United Nations in Damascus said on Friday. The United States and its Western allies said the initial report showed Damascus was behind the attack, which killed hundreds of people. President Bashar al-Assad‘s government has denied the accusation, blaming rebels instead. The incidents also include an alleged chemical weapons attack in March in the northern town of Khan al-Assal, where authorities say rebels killed 25 people, including 16 soldiers. Rebels said government forces were behind it. The two other cases from earlier this year both date back to April – one in the Aleppo district of Sheikh Maqsoud and another in the town of Saraqeb in the northern province of Idlib. The three most recent incidents were in Bahhariyeh and Jobar, both east of central Damascus, on Aug. 22 and 24, and Ashrafiat Sahnaya to the southwest of the capital on Aug. 25, the U.N. statement said. The team returned to Damascus on Wednesday to resume its work and “expects to finalize its activities in the country by Monday,” the statement said. IHS Jane’s Report: Islamic Extremists Dominate Rebel Fight in Syria. Nearly half the rebel fighters in Syria’s civil war are Islamists or jihadists, according to an upcoming report by the intelligence analysts, IHS Jane’s. “The insurgency is now dominated by groups which have at least an Islamist viewpoint on the conflict. The idea that it is mostly secular groups leading the opposition is just not borne out,” Charles Lister, author of the analysis said, according to a report in Britain’s Daily Telegraph. Some 100,000 fighters have been battling the Bashar Assad regime for two years but they are fragmented into hundreds of bands, some of which are loyal to larger factions. Almost all the rebels are Sunni. The regime is Alawite, an offshoot of Shi’ite Islam. Western policymakers fear weapons they supply to the more moderate forces could wind up in hostile hands. The moderate fighters want to overthrow Assad, Syria’s authoritarian dictator, while jihadist groups want to transform the country into a hard-line Islamic state that is part of a regional Muslim caliphate. It’s a tricky balance. If the West looks as though it is not seriously interested in removing Assad this could push the relative moderates closer to the Islamists, Lister of IHS Jane’s says. 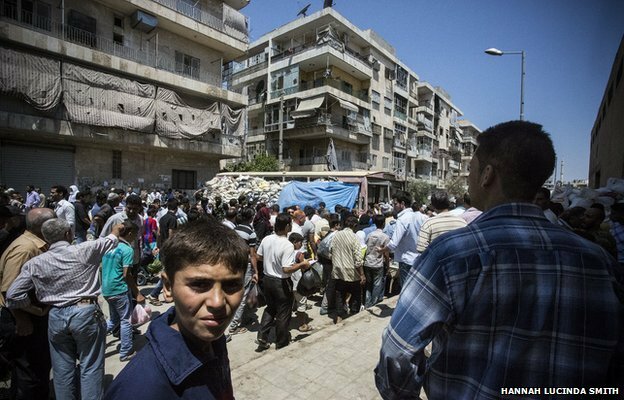 How God Is Moving in Syria Despite Heartbreaking Persecution. In this exclusive interview with Charisma News, Jane (not her real name), a Syrian Christian, gave us a firsthand account of what it’s like to be a Christian in the war-torn country during this dangerous and uncertain time. Charisma News: This is a classic case of where the media has trumped up the story in Damascus where 1,100 people were gassed on Wednesday, Aug. 21. Jane: Actually, we read everything, and we said to our people here that most of the media lie about what happened. We know there’s a lot of kidnapping of people. We know a guy who’s 17 years old who was kidnapped, and he said there were hundreds of bodies, and a lot of children and women were kidnapped. Many times they burn them, take pictures and show villagers, and everyone’s talking about this. That may have happened, but we don’t know the real truth. Yesterday the UN, in a closed meeting, said, “We don’t have any information that the Assad soldiers did that. And we already have a group from the UN inside Syria, and they don’t find any proof, so we remain until there is proof toward this situation.” Both sides may use chemicals, and we are sure the rebels are using the chemicals because we are there. Charisma News: What do you see God doing in spite of all the persecution and what’s being reported? Jane: We are now experiencing that this is the best spiritual time for Syria and other countries, like Egypt, because as much as their suffering is great, they are growing. We experience how refugees run away from their places because of the bombing from the government. They came to Damascus and to the churches, and they came to find the truth of the real God. Many of the Muslim families came to our church, and now our church has 2,000 families of refugees. They told us, “We don’t know if this is the real Islam.” We said, “Yes, this is Islam. This is what they teach in Quran.” They said, “We don’t want to follow Muhammad anymore. We don’t want Islam. We want to know the real God.” So we give them New Testaments, and we follow up with them, have meetings, preach the gospel, and then we give them food. Thank God, we saw how He is moving among those families that before we couldn’t reach because they don’t even know there are Christians in this country. They are covered; it’s very hard. So we thank God, because everything happens because of His goodness. We saw that this war is not from God because of how much the terrorists came and tried to strip the Christians, telling them to go out from the country—“This is our country. It’s our country.” At the same time, we are experiencing how much evil is active now because there is a big change on the other side, where we have a lot of opportunities to show Jesus Christ. And we have one prayer a day for the country for six months, inviting people from any denomination—Muslim denominations and Christian denominations—and we pray with them for the country. And when we pray, we pray for Sunni and Shia and Christians and Jews and enemy religions. We pray for all denominations, and we pray for all people. That prayer meeting, God opened from this prayer to make resolutions among Sunni and Shia. We believe God is doing miracles because He promised us from 2004 that a big revival is coming. It wasn’t like we were expecting. We expected big places, a crowd of people would come to the place. But His way is opposite, not like our ways, because this is through the war. Thank God, at the same time, we believe that somebody is being saved. We are waiting and believe that God will change the situation for victor[y], and we are using the suffering time that believers get stronger and people come more. Even though we have a lot problems, a lot of suffering, a lot of hurting, we still, we can’t do anything but stand still. Charisma News: How can we pray for the situation there? Jane: American believers have to wake up and know that there are other members of the body who are suffering. It’s very important to have more information about what’s happening on the other side because suffering is caused by the people who are supported by your government, by your taxes and your money. It’s very hard for us when we are walking on the street and there are a lot of mortars above our heads and around us. Thank God He protects the believers. But this is the life we are living now. We walk down the street, and we don’t know if we will come back to our home or not. Everyone is going from Syria, from Damascus and Aleppo. We are leaving our home, and we don’t know if we will come back. It’s a very hard life because every moment we are expecting death. We hear of tortures, kidnappings, 500 die, 700 die, 200 die. This is a big problem. My area now is very dangerous, but we’re still alive, thank God. You have to pray for awakening of your government. Because one day those people who are supported by your government, they will kill your people. Believe me, this is their aim. This is their goal. We want you to pray for that, that the country will stop the killing, stop the Syrian forces, that terrorists will not be supported by the Turkish board or the Muslim board. It’s very hard for us when we heard how much people come against our country. It’s very, very dangerous for us. Please pray that God will stop the terrorists and not let them enter any more. Already we have 600,000 terrorists—from Afghanistan, Libya, Egypt and many areas. We also want you to pray for the Turks because they are now trying to build a kingdom of God above Syria. This is the dream of the believers, except for Syria. At the same time, we are expecting more and more people coming to Jesus Christ, and we want you to pray for distributing the New Testament. We have had good experiences with this. Many years ago, our church had a vision to have one New Testament for each Syrian—that’s 23 million. In our country, the government gave us permission, and we distributed more than 300,000 New Testaments. But during the war, we distributed 50,000 and 20,000 audio New Testaments and 3,000 children Bibles. This is a big aim, and we are already doing it in no time. Thank God He is using this ministry, and we have many, many experiences about how God is using this ministry and people being blessed by the New Testament. We want you to pray also for the children, for the situation, the economic situation. People are very down. People don’t work now. Prior to the situation, if someone has any problem, they can’t go to the police station because the police station is controlled by the terrorists, and we can’t have any solutions from the government. We need real protection and for God to stop this war. Charisma News: Like you say, the reality of death is everywhere. I’m sure every time you step out, there is a supernatural protection on you. Jane: We can be kidnapped any time because of our faith. We expect our daughters may be kidnapped. It’s not an easy life. We expect death. We are always prepared for death. I told my daughters that someone may come and kill us at our door. The terrorists are full in this country. You will see some blood, you will have some pain, but He will open the heavens, and we will enjoy being with Jesus and angels, and He will say, “I forgive you, God loves you, Jesus loves you.” Many times He will use us and will glorify His name through our life, but we are in a very dangerous situation. We need your prayers. We are blessed by this suffering, and we are aimed at winning. What’s happened in America? We are really worried. The Christians, the believers there, are sleeping. They don’t know anything about suffering in other countries. They are blind. We are not supporting the regime, but we know that the regime with people is much better, and we can accept it, and we can live with them from Sunni. Before, we had a big freedom to worship God, and we could do huge events and no one would stop us—Muslim or other nations—because we had the freedom from our government. They gave us a church where we could do whatever wanted—even rent a big stadium. You can do what you want, and no one can stop you. I had a female friend who was once asked, “Why do you get the New Testament in school?” She’s a believer from a Muslim background. The principal of the school is against her, but the government agreed that the people who are following what is written in the New Testament are the best and follow exactly what is written. “Go, and no one can stop you because of this book, we support printing it, and everyone who wants to read it can read it. Call me if someone stops you.” We have a lot of stories like this. In the end, people who produce the New Testament get protection from the Secret Police because it is very legal to distribute them in our country. We had freedom before. Assad wasn’t against them and ministry, but his fault was he wanted to give freedom to all, and the last time, when we had freedom under Assad’s regime, it was like going crazy. In 10 years, they were building mosques in a crazy way and wondering why we have so many mosques. We are afraid one day they’ll say we don’t have freedom of religion. So Assad gives all people freedom. We are Christians. We keep the situation. While we are not weak, we begin to grow. Russia: Report Blames Syrian Rebels for Chemical Weapons Attack. A 100-page report that Russia says it has compiled details what the country says is evidence that the Syrian rebels carried out a deadly sarin gas attack in an Aleppo suburb in March. The document, disclosed late on Wednesday by the Russian Foreign Ministry, appeared to counter accusations that forces loyal to President Bashar Assad where behind the attack in the Khan al Asal suburb, McClatchy reports. The foreign ministry said the report was delivered to the United Nations in July — and that it included detailed scientific analysis of samples that Russian technicians collected at the site of the alleged attack. The investigation of the March 19 incident was conducted under strict guidelines established by the Organization for the Prohibition of Chemical Weapons, Russia said. The international agency governs adherence to treaties prohibiting the use of chemical weapons, according to McClatchy. Russia said samples that its technicians had collected had been sent to OPCW-certified laboratories in Russia. The document itself was not released, McClatchy reports. The foreign ministry, however, drew a pointed comparison between what it said was the scientific detail of the report and the far shorter intelligence summaries that the United States, Britain, and France have released to justify claims that the Syrian government used chemical weapons against Damascus suburbs on Aug. 21. The longest of those summaries, by the French, ran nine pages, McClatchy reports. Further, each relies primarily on circumstantial evidence to make its case, the Russian Foreign Ministry said, and they disagree with on some details, including the number of people who died in the attack, according to McClatchy. No immediate comment was available from the United States, McClatchy reports. 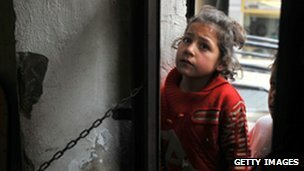 Aleppo: A city where snipers shoot children. 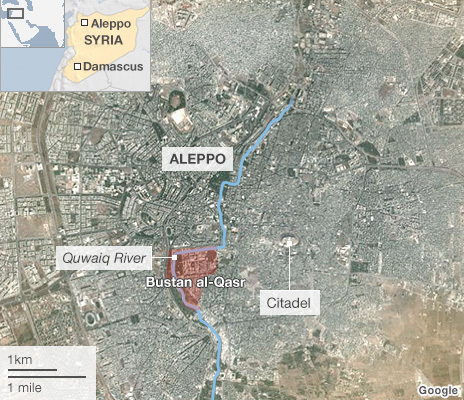 Bustan al-Qasr is the last remaining crossing point between the rebel and regime-held sides of Aleppo. Snipers are rife and the atmosphere tense, yet hundreds are forced to use it every day to get to work, to study and buy food. Sam, crouching behind sandbags at the Bustan al-Qasr crossing point, is the only doctor on hand to treat those targeted by the snipers. He is 25, speaks in an urbane North American drawl and has humorous eyes twinkling above his surgical mask. He is the son of Syrian exiles who settled in Canada. “I was in the final year of my studies to become a cardiac surgeon,” he tells me. But then he felt that he had to come here. 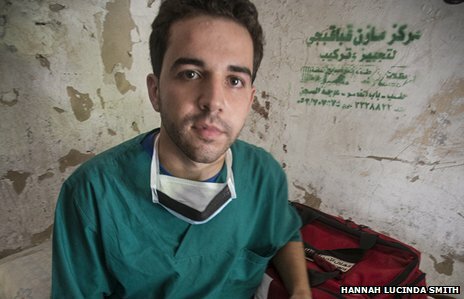 Now he sleeps in a room in the field hospital where he works. And in his time off, he comes to Bustan al-Qasr to wait for the snipers to open fire. The pavement he sits on is dotted with dark brown blood stains. Everybody reacts differently to the sound of the sniper’s bullet. When shots ring out, the sea of people in the marketplace parts as most people press themselves against the walls of the buildings – as if, somehow, that will save them. But the fatalistic ones just carry on walking straight down the middle of the road in a gesture of defiance. “Sometimes they just fire in the air, to scare people,” I am told. But sometimes they do not – Sam’s work bears witness to that. The frenetic energy of Bustan al-Qasr’s marketplace is super-charged with fear. Sara is an activist and a student and she runs the gauntlet every week. Her home is on the rebel side of the city and she crosses over to pick up her notes from the University, which is in the regime-held part. During exams, she crossed almost every day in her determination to do well. “One day I crossed in the morning, and by the time I came back 15 people had been killed there,” she says. She did pass her exams but she is disappointed with her marks. “I did better last year,” she tells me. “No wonder,” I reply. 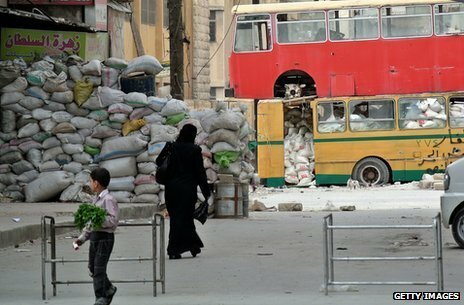 And many families in wartime Aleppo can only buy food if they cross over into opposition-held territory. Until recently, the checkpoint was controlled by a group of rogue rebel soldiers who tried to extort money from the already desperate people using it. The last time I came to Bustan al-Qasr they tried to arrest me and confiscate my camera. But then a sniper opened fire. In the confusion, I escaped. Now it has been taken over by Ahrar Sureya, one of the city’s largest rebel brigades. 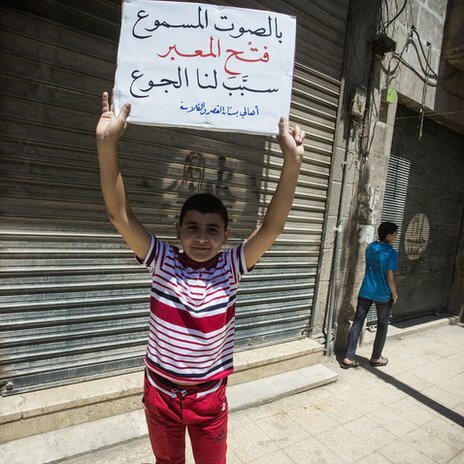 It is progress for the people who use the crossing point, but also a sign of how fluid and unstable Aleppo’s testosterone-charged local politics has become. This is a city of fiefdoms. Last week Bustan al-Qasr belonged to the criminals. Today it belongs to Ahrar Sureya. And next week, who knows? The rebels take me to meet Abu Yassin, a senior official in the rebel-held part of the city’s Sharia Court police force, who is now in charge at Bustan al-Qasr. On a corner where the main street meets a side road he points to the buildings where the snipers are stationed, in a government-owned tower block, in an apartment building, in a minaret. Some people in the rebel areas want the crossing point closed altogether. Those at Friday demonstrations here no longer call for democracy, or freedom, or human rights. They want the complete dismemberment of this already fractured city. And while closing Bustan al-Qasr might stop regime informants coming into the rebel side of the city, it would be disastrous for many. It would mean failure for Sara, and maybe starvation for the families on the regime-held side. Because however chaotic, however deadly, Bustan al-Qasr is a lifeline. It is the last artery connecting a divided city and the only choice for many people. And the mass of human beings who throng around it – Sam in his field clinic, Sara with her lecture notes and the market traders in the sniper’s sights – tell the real story of Aleppo’s conflict: one of people trying to carry on with their lives amidst a war they never chose. BBC World Service: Short editions Monday-Friday – see World Serviceprogramme schedule.